Our original plan was to visit Omkareshwar on 17th-April-2013 and Mahakaleshwar on 18-April-2013. But due to the problem with the car's tires, we had to postpone the 17-April-2013 trip to the next day. 7:30am Left Ujjain towards Indore, to further continue to Omkareshwar. We took the road that goes to Khandwa for going to Omkareshwar. There is lot of construction going on where this road crosses the A B Road. You can see many colleges on this stretch. I even remember seeing the proposed site for Indian Institute of Technology, Indore on this road. 10:15am Crossed Choral, there is a railway station visible. 10:50am Crossed Barawah. There is a railway station visible right on the main road. 11:00am Left the main road by turning left towards Omkareshwar. From there the road become worse. It is very narrow and just about drivable. 11:15am Reached Omkareshwar. There are many parking places leading up to temple. One needs to park in one of them. On busy days, one may have to park much earlier and walk. The road leading towards temple is narrow with road side shops for prasad etc. 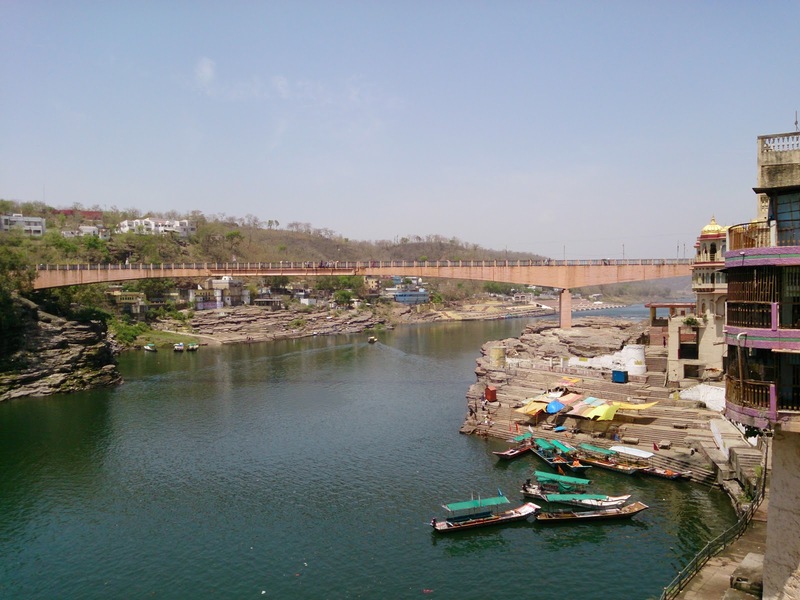 To go to temple, one has to cross a pedestrian bridge over Narmada River. Actual temple is on an island. So this bridge is only way to reach there. There is also a big Shiva statue up the mountain which one can only go by trekking. We did not go there. As one can see, even god is commercialized now a days. Mobile companies are vying with everybody else to plug themselves at god's place. As ususal, it is a good idea to by prasad from the vendors closer to temple, so you can leave your footwear there. In Omkareshwar, there is a hardsell from freelance pujaris to do some or other puja on your behalf, so one needs to be careful and signup for what one wishes. The temple was not very busy and it took us around 30 minutes to do darshan and get back to parking. Here is another panoramic view of whole area. Since we had started in the morning without breakfast, we decided to drop in the Madhya Pradesh Tourish Corporation run Narmada Resort for breakfast. Here is my review of this place in tripadvisor. 1:05pm We left Omkareshwar back to Ujjain where the next place to visit was Mahakaleshwar Jyotirling. 4:00pm We reached Mahakaleshwar Jyotirling in Ujjain. 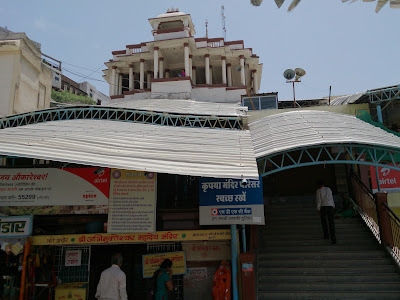 Mahakaleshwar temple is in the middle of Ujjain town which is a proper city so on busy days, it becomes difficult to find parking etc. But on lean days, there is sufficient paid parking. 5:20pm We were out of Mahakaleshwar temple. This completed seven jyotirlings that we had set out to do. Our return journey was planned after a break of couple of weeks.